In the wake of their Fathers death, two estranged siblings begin a journey of self-discovery. When family responsibility conflicts with their dreams, they must learn to love each other before they can truly begin to heal in The Human Project. Grief is a horrible feeling, but it is one we will all have to experience at some point in our lives. Many people react to bereavement in different ways, some people use it as a chance to reflect, others as a way to reconnect with family, while others use it as a reason to escape from the daily grind. Each of these outcomes is explored in Spencer Jones’ lovely little 13-minute film The Human Project, as the main characters in this two-handed drama, discuss all three of them during one poignant phone call. David Beatty and Chelsea Alden play Marcus and Frances; an elder brother and younger sister who, being born 13 years apart, are not particularly close. They are of course family but have struggled to relate to each other as adults and chosen different paths in life. The death of their father means they have to interact for the first time in a long time. We first meet Frances camping in the great outdoors, it hasn’t been long since her father’s death so we assume she is rebellious and uncaring. She makes a phone call to her brother to check he received a letter she sent with regards to her location. Marcus is at home looking after their Mom and sorting out their father’s memorial service and these initial introductions bookmarked by voice-overs by each character leads us to believe Marcus is the more caring, stable and responsible half of the siblings. It is thanks to a great script written by actor Beatty that we soon learn they are both genuinely nice people dealing with their loss in different ways and what we initially think about the two characters doesn’t seem to be the case at all. Marcus works for NASA as a scientist and he has been tasked with defining what it is that makes the human race unique. In one of the film’s best pieces of dialogue, Marcus explains to Frances that he only has a limited amount of space to define the human race, 140 characters to be precise. The size of a Tweet asks Frances and the absurdity of Marcus’ task is hit home with a simple pause and reply of ‘Yeah’. The next 9 minutes are punctuated with a number of conversations between the two of them that cover everything from memories to regrets and run the whole gamut of emotions from Happiness to anger with everything in-between. To keep the conversations interesting, director and editor Spencer Jones, who made his name working on music videos, use quick edits and flashy cuts between the two completely different environments to highlight the metaphorical and literal distance between the siblings. Jones, also at times, has the two actors conversing face-to-face which is an interesting concept that works really well here. The Human Project is only 13 minutes long yet it packs into its runtime a huge amount of character development and it never seems rushed. Jones is once again helped in this aspect by David Beatty’s terrific script which is extremely well written and the two very capable actors performing the lead roles. Both Beatty and Alden are outstanding, creating well-rounded characters with a chemistry and relationship that is extremely believable. Both characters go on a journey of self-discovery during this one phone-call and both come out of it as changed people by the end of the film. It is easy to see that this call will likely be the longest conversation they have both had with each other for a very long time. 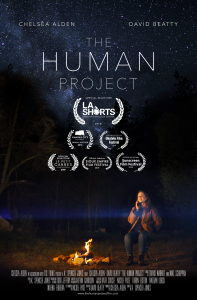 The Human Project is an emotional and entertaining short film. The fact that it has won prizes at a number of festivals already is no real surprise. It’s a lovely little tale that manages to wear its heart on its sleeve without resorting to cliché. It is well written, well acted and well directed and if you have the opportunity to catch it at a festival nearby, then do so. Maybe if you are lucky, watching The Human Project will help you to craft your own definition of the uniqueness of the human race and then hopefully you can shorten it to 140 characters.